Life insurer Prudential has sold its loss-making internet bank Egg to US banking giant Citigroup for £575m. 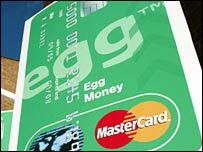 The Egg business has struggled in the highly-competitive UK personal finance market, and is estimated to have made an operating loss of £145m last year. Prudential said Citigroup saw "enormous opportunities to develop Egg's business in the UK". The UK insurer also announced that its new business sales rose by 16% last year to £2.47bn. The increase in Prudential's sales was mainly driven by growth in the US and Asia, with overall UK sales up by just 1% to £900m. While UK retail insurance sales rose 14%, thiswas offset by a fall in wholesale business which Prudential said was a result of it being unwilling to chase sales by cutting prices. The deal to sell Egg comes just a month after Prudential said it had rejected a "speculative" offer for the internet business. It had mulled selling off Egg two years ago. However, in December 2005 it took total control of the firm by buying the 22% stake it did not already own - a deal which valued the business at about £973m. In its sales update released on Monday, Prudential said trading conditions at Egg had worsened since October "as a result of worsening credit experience and lower levels of lending than anticipated". "The sale of Egg to Citigroup realises greater value for our shareholders than retaining the business within the group," said Prudential chief executive Mark Tucker.